As we know, the Czech Army will form a new Airborne Regiment in 2020, in order to rise the number of its tactical elements from two to three and to complete the 4th Rapid Deployment Brigade (light maneuvering element) and the 7th Mechanized Brigade (heavy maneuvering element). The Czech paratroopers, who now form the 43rd Airborne Battalion within the 4th Brigade, are equipped with the Land Rover Defender 130 Kajman, a 4x4 lightweigh vehicle, out of production and reaching its life expectancy. A possible replacement is the Long Range Patrol Vehicle (LRPV) Gepard based on Toyota Land Cruiser Model 70. The Land Rover Defenders, in use with the British armed forces from the 1950’s, are out of production since January 2016. Within the Czech Army these vehicles replaced a number of the soviet-era off-road one-ton UAZ-462. The Czech airborne light specific variant Land Rover Defender 130 „Kajman“ carries six men (a driver and 5 airborne squad troopers), and is fitted with front and back protection of STANAG 4569 Level 1. At 4100 kg is can be easily airlifted and air-dropped, and it travels at 110 km/h on the roads, with 600 km range. The 43rd Battalion currently operates 79 vehicles, armed with the commander’s PKB (7.62 mm machine-gun), and with the DShKM (12.7mm machine-gun), NSV (soviet replacement for the DShKM) or the AGS-17 (30mm automatic grenade launcher). The requirements for Kajman’s replacement consist primarily of the ability to accomodate six fully equipped soldiers and to be fitted with modular ballistic protection in order to adapt the vehicle to different types of missions. 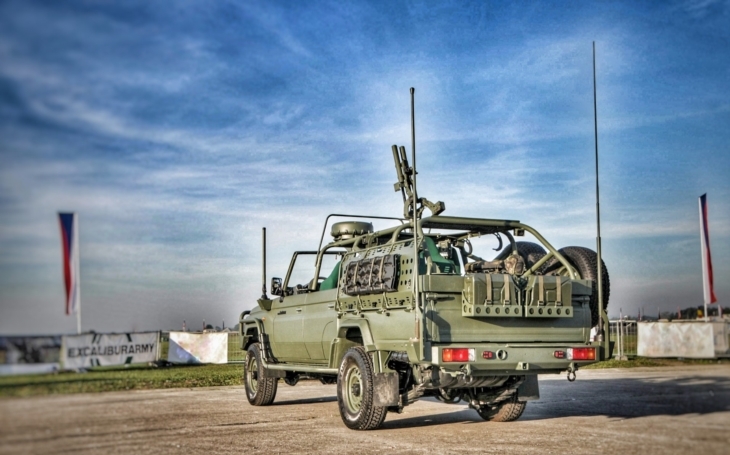 The Long Range Patrol Vehicle (LRPV) – Gepard and the Rapide Deployment Vehicle (RDV) – Cheetah based on Toyota Land Cruiser 70 were developped by Dajbych, Tatra Defence Vehicles and Optokon to replace the Kajmans. Gepard’s chassis allows to reach the total weight of 5.5 tons. The vehicle is able to transport radio equipment, IT devices, weapon station mounted with a 12.7mm machine-gun, it carriers two mounts for light machine-guns, RPGs, ammunition, food rations, water, camouflage net and engineer tools, while there still is a payload reserve. All wheels are equipped with the Runflat system which enables the vehicle with punctured tire to continue to be driven at reduced speeds and for limited distances. Two tanks of 180 l provide the maximum range of more than 1,000 km.